With most of Ontario having experienced at least one major snowfall already this winter, many pet lovers across the province have begun to undergo that yearly activity of walking their dogs in the snow. This is a subject that was discussed in our blog last year, but it’s time to broach the subject once more to ensure that our dogs are not only getting exercise but also staying safe while doing so. What Makes Winter Walking Different? Keep your dog warm during your walks by ensuring that they have the protection from the cold air, just like you do. Short-haired and elderly dogs in particular benefit from the added warmth of a sweater. The more coverage the better and make sure that it covers their belly. Keep in mind, however, that age and health can have a major influence on how long a dog should stay be outside. If walking at night, consider a sweater or jacket for your friend that has reflective material sewn in. The nights are longer and it can be very difficult for cars to see them. Boots will prevent those large snow and ice balls from collecting in their foot pads and their feet from direct contact with the sub-zero ground beneath them. As soon as you both get home from your walk, dry them off to remove any snow and ice from their body and feet. The rubbing action will also serve to help warm-up your friend. Make sure to remove any snowballs from their foot pads very carefully with your fingers as this can be a sensitive region. All of that road salt that is great for keeping you safe from driving can also be quite bothersome. Not only does it discolour your shoes but it can be much more dangerous for your pet, causing vomiting and diarrhea. Boots can prevent the salt from burying into your dog’s foot pads. They’re not just for keeping snow out. Chemicals such as road salts, calcium chloride and antifreeze find their way onto roads and sidewalks everywhere in the winter. Ensure that when you wipe your friend down when returning home you pay attention to all exposed areas. If these chemicals are ingested through licking it could mean a trip to the emergency veterinary clinic. Consider a bowl of warm water and a cloth by the door when you return to wash your pet’s feet. Additional chemicals that are designed to help humans combat the winter can be found on the roads, and also found in more plentiful supply in garages, sheds and homes… another reason to clean your dog’s feet after a walk in the street. Store any and all winter care chemicals where dogs, cats or children cannot gain access. Ingesting any of these may be fatal. Ethylene Glycol, commonly known as “antifreeze”, smells and tastes sweet so is difficult for your pet to ignore. Shortly after ingestion, irreparable harm is done to the nervous system and kidneys if emergency action is not taken immediately. 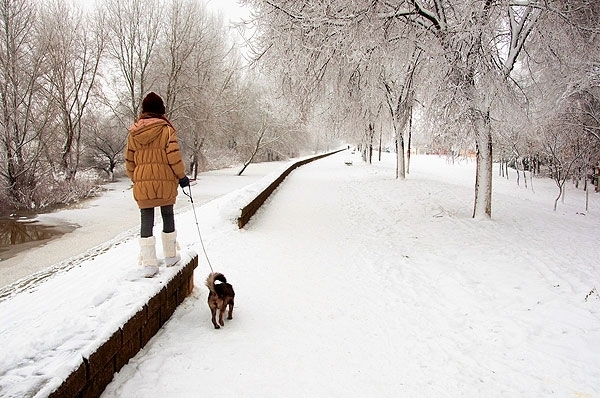 Just because the weather gets frigid and the snow piles up doesn’t mean that a regular walking routine can’t continue as normal, as long as precautions are taken for the safety of both you and your pet. For more ideas on how to keep your dog fit and healthy during the winter months and prepare for mother nature’s chilly worst, talk to your veterinarian today.